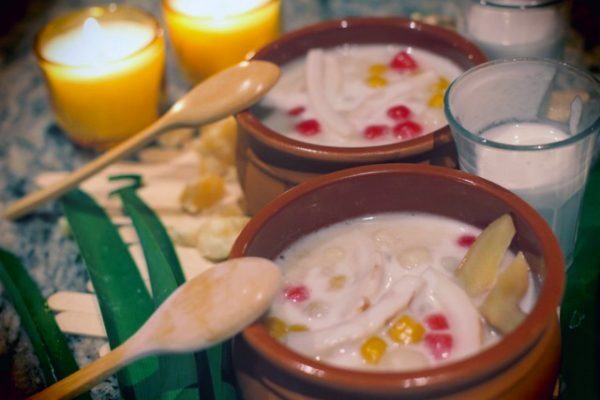 Boa Loi is a famous delicacy of Thailand, in English it translates to pumpkin balls in ginger syrup with coconut milk. To make the ginger syrup add the palm sugar, ginger and water to a medium pot and let it simmer over a medium heat for 10-15 minutes to make the ginger syrup. Meanwhile, cook the pumpkin over a steamer for 5 minutes or until it has cooked through and is tender. In a bowl, knead the cooked pumpkin and sticky rice flour until it is well combined. The consistency should be dough-like and should not stick on your hands. If you feel that the dough is still sticky add some more flour. Roll the dough into very small balls. Mix the pumpkin balls in the boiled ginger syrup over a low heat. Once they are cooked, they will float. Once the pumpkin balls are cooked, turn off the heat. Add a pinch of salt into the coconut cream in a separate bowl and then add the coconut cream to the pumpkin balls. Knead 60 g of steamed taro with ¼ cup of sticky rice flour and add 3 tbsps of water. Knead 50 g steamed beetroot with ½ cup of sticky rice flour and add 3 tbsps of water.